Amy Winehouse was born to a Jewish family in Southgate London on 14 September 1983 at 10:25 pm (Source: Frank Clifford quotes Winehouse's mother to a mutual friend of astrologer Margaret Zelinski. RR: A). She began singing and playing the guitar shortly before her first Saturn opposition. By the age of 20, she had been signed to Simon Fuller's record company and the rest, as we like to say, is history. She stormed into our cultural consciousness with "Valerie" and "Rehab". Beehive blazing, she was a jazzy cross between Sarah Vaughan and Morticia from the Addams Family. Astrologically, Amy was a Mercurial character: her ascendant was in Gemini with its ruler in Virgo as well as a Mars-Venus, in Leo, in conjunction in the 3rd house. Her career and public image were often described as "dichotomous" a handy synonym for Mercurial influences. However, the majority of planets are in the northern hemisphere, countering Mercury's need to communicate and receive information openly. What we saw in Amy's performances were pure, gut wrenching, honest emotions—when she sang about not wanting to go to rehab, she wasn't kidding. Unusually, Amy's chart is marked by five pairs of conjunctions: Venus and Mars in Leo, Sun and Mercury in Virgo, Saturn in Scorpio/Pluto in Libra, Jupiter and Uranus in Sagittarius and Neptune in Sagittarius/Moon in Capricorn. With the exception of Chiron in the 12th, it would almost appear that the planets have lost their autonomy and instead, need to function as couples. This theme on relationships, particularly dysfunctional ones, features prominently in Amy's music and is reflected in her lyrics. Venus and Mars in conjunction in Leo typically like to play their relationship dramas out in public and are particularly adept at getting everyone to notice their troubles. Located in the third house, this conjunction was perhaps responsible for the attention drawn to Amy's striking, deep contralto voice, diction and lyrics--consciously or unconsciously—telling the tales of complications in love. The Venus-Mars conjunction in Leo makes a loose trine to the disassociate Moon/Neptune conjunction. 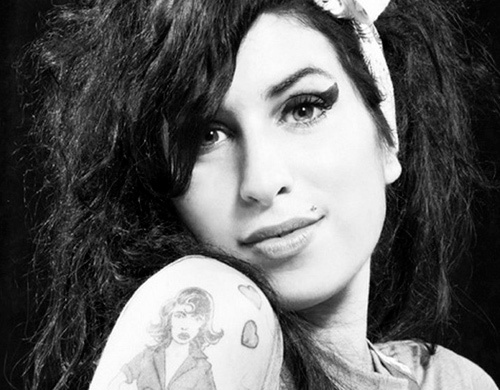 Music, particularly Jazz, was deeply embedded in Amy's life and her grandmother had even been engaged to Ronnie Scott. No one with Moon conjunct Neptune would take well to keeping one's feet on terra firma. As nothing Leo energy does is quiet or subtle, we got the drunken lion's roar with every snap shot of the paparazzi. In the years before her tragic death, she had tottered on the nebulous edge of reality, every moment of undignified escapism chronicled in the tabloids, held up for ridicule via sloppy double entendre making less hedonistic heads shake in wonder. As she publicly fell apart in early 2011, transit Pluto was beating on the threshold of the Moon-Neptune aspect, setting off the rapid destruction of this aspect. Her Progressed Moon's presence only seemed to signal sobriety was not in sight. And in the seventh house, this aspect manifested in her choice of men, none of whom were in any position to be a positive role model to sobriety. Transit Pluto was conjunct her descendant when her debut album Frank was released on 20 October 2003 and had transited her Neptune/Moon conjunction 3 years later when Back to Black was released. Additionally, when Back to Black was released, transit Saturn was conjunction Venus/Mars whilst transit Jupiter was square to it. Saturn represses and on Venus/Mars can miniaturize the exuberant charm of the conjunction whilst focusing the competitive edge. For example, the lyrics for the award-winning "You Know I'm No Good" emphasises Amy's negative self image whilst the track "Back to Black" reflects her dignity in heartbreak. Jupiter, however, can make a big deal out of very little. Particularly as it is conjunct Amy's natal Uranus. From the same album, another award winning song, "Love is a Losing Game" makes a rather grand proclamation on the troubles of having a Venus/Mars conjunction in Leo with a Saturn transit. Although Amy continued to gain recognition for her talents in 2007, 2008 was a particularly big year for her, even winning her a place in the Guinness Book of World Records (2009) for the most Grammies won by a British female act. In May 2008, transit Neptune opposed Amy's Venus/Mars conjunction. Neptune has the rather nifty feature of reflecting distorted images. A sculpture of Amy, entitled Excess, appeared in London's Mall Galleries featuring a miniature of her covered with what appeared to be tiny pills (while one outstretched hand held a glass), lying on top of a cracked champagne bottle, with a pool of spilled liquid underneath. Another piece entitled "Celebrity 1" also appeared at the same exhibit. On 23 July, exactly 3 years before her death, her wax sculpture went on display at Madame Tussaud's. Later that same year, a sculpture by Marco Perego, entitled "The Only Good Rock Star Is a Dead Rock Star", was scheduled to go on display in New York's Half Gallery on 14 November 2008. The sale price for the sculpture is listed at US $100,000. Perego said of the sculpture: "Rock stars are the sacrificial animals of society." Winehouse's spokesperson said "It's a funny kind of tribute. The artist seems in thrall to a tabloid persona that is not the real Amy. People often use her image to sell their work." The progressed planets during this time formed a harsh grand cross between progressed Jupiter/Uranus/Moon opposite Chiron, both square to progressed Venus/Mars on the IC. Even without detailed delineation, this configuration would challenge even the most stable of personalities—imagine being feted as the brightest young British talent in years only to be portrayed as a hopeless junky! On top of this, Chiron was in trine to Mercury, thus bringing the news of rapidly declining health: at the age of 25, she was diagnosed with emphysema. Natal Pluto and Saturn, in disassociate conjunction (Pluto in Libra, Saturn in Scorpio) in the fifth house, formed the apex of a magic triangle configuration, also very much like the one prominent in the charts featured in the other members of the "Club of 27". Any configuration of "easy" aspects produces an electrifying zing of never ending energy. Planets caught up in the configuration by transit or progression only serve as food to be consumed by the raging gods. A Saturn-Pluto conjunction as a focus for this configuration could have acted like a shield for Amy’s emotional turbulence. The need to party away the nerves of Neptune-Moon but yet have all the attention the Venus-Mars conjunction in Leo craves could have led to a much faster burn out had it not been for the steely reserve of Amy's Pluto-Saturn conjunction. Without this aspect, in the fifth house, performing live may not have been possible for a vulnerable personality like hers. No matter how much "talent" a person possesses, without nerves of steel (naturally occurring or otherwise), a performer is impotent on stage. And Amy performed live over and over and over again. Unlike the "Club of 27" members who made their names during the '60's, Amy's chart is in possession of a few square aspects. Generally speaking, squares usually add "grit" to a chart. They make a character, forcing it to do something to overcome limitations rather than passively wait for answers to arrive like a bolt from the blue. 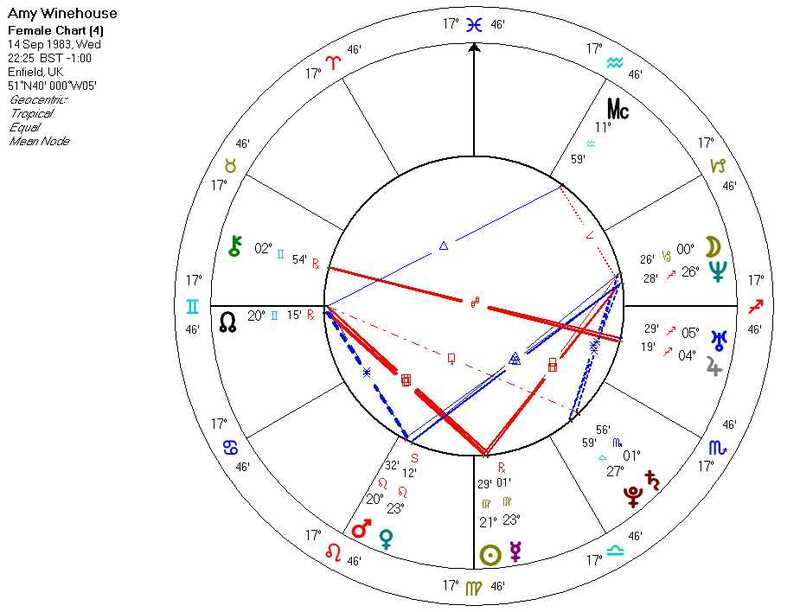 Sadly, Amy’s Sun-Mercury conjunction in 4th in Virgo needed emotional and mental precision as a way to express the anguish of living in an imperfect world. However, this conjunction, by turn also in conjunction to the Uranus-Pluto conjunction of the mid-60's, was in a square aspect to natal Neptune. In Amy's case this meant whatever foothold she was able to get in life simply served to cause her to slip and stumble. 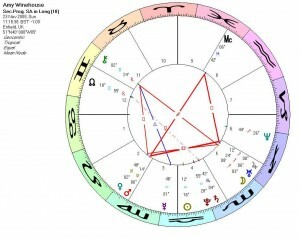 In a career where alcohol, fame and drugs are so readily available, Amy Winehouse fell into the abyss and like the other members of the "Club of 27" she died as transit Uranus was in trine to its natal position. Gamboa, Glenn. "Amy Winehouse takes home 5 Grammy Awards.". Archived from the original on 13 February 2008. Greenwood, Richard (2008-05-14). "Amy Winehouse sculpture to go on display." Telegraph.co.uk. http://www.telegraph.co.uk/arts/main.jhtml?xml=/arts/2008/05/14/bbwinehouse14.xml. Retrieved 2011-08-18. "Winehouse leaves London clinic". Upi.com. http://www.upi.com/Entertainment_News/2008/07/01/Winehouse_leaves_London_clinic/UPI-75471214921764/. Retrieved 23 July 2011.